Speaking on the launch,Ankit Gupta, General Manager, Uber said, “We are excited to launch uberTUK in Colombo as part of our vision to provide reliable transportation options for everyone, everywhere. We are keen to expand our product-mix offering across the island nation and products like TUK will go a long way in complementing public transit effectively and help us to be a true multi-modal partner and platform. This initiative will also help integrate existing three-wheeler drivers in the city into the technology based ridesharing ecosystem and supplement their entrepreneurial journey”. 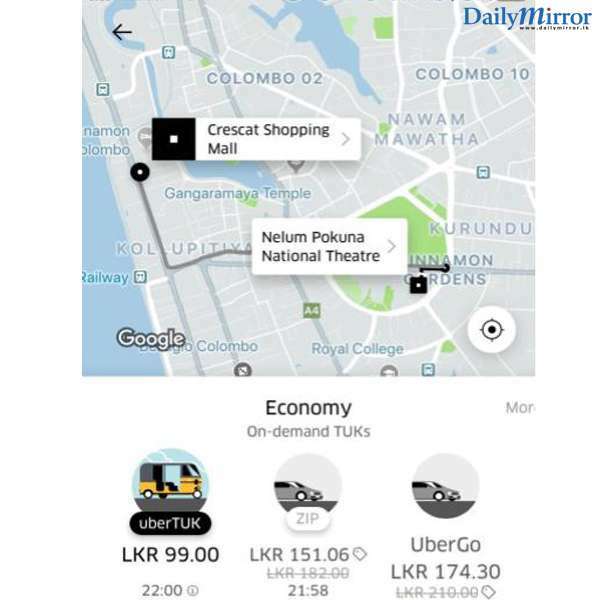 UberTUK offers introductory base ride fares priced at less than LKR 99 for the first 5 kms. It will include all safety features available for riders and includes all payable options including cash and debit/ credit cards. Riders can now benefit from upfront fares before they book atuk ride and thereby have access to hassle free ride with transparent fares. 4. On confirmation, the riders will see the driver’s details straight away - name, photo and the details of the tuk.